Italian scholar; born before 1538; eulogized by the greatest of his contemporaries as the most eminent preacher of his century and as a prominent scholar. He and his brothers Moses and Judah were leading members of the congregation in Mantua. 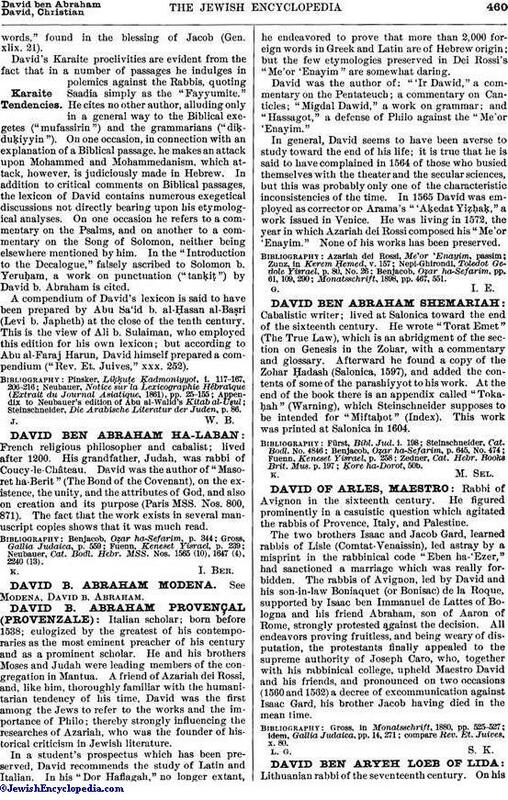 A friend of Azariah dei Rossi, and, like him, thoroughly familiar with the humanitarian tendency of his time, David was the first among the Jews to refer to the works and the importance of Philo; thereby strongly influencing the researches of Azariah, who was the founder of historical criticism in Jewish literature. In a student's prospectus which has been preserved, David recommends the study of Latin and Italian. In his "Dor Haflagah," no longer extant, he endeavored to prove that more than 2,000 foreign words in Greek and Latin are of Hebrew origin; but the few etymologies preserved in Dei Rossi's "Me'or 'Enayim" are somewhat daring. David was the author of: "'Ir Dawid," a commentary on the Pentateuch; a commentary on Canticles; "Migdal Dawid," a work on grammar; and "Hassagot," a defense of Philo against the "Me'or 'Enayim." In general, David seems to have been averse to study toward the end of his life; it is true that he is said to have complained in 1564 of those who busied themselves with the theater and the secular sciences, but this was probably only one of the characteristic inconsistencies of the time. In 1565 David was employed as corrector on Arama's "'Aḳedat Yiẓḥaḳ," a work issued in Venice. He was living in 1572, the year in which Azariah dei Rossi composed his "Me'or 'Enayim." None of his works has been preserved. Monatsschrift, 1898, pp. 467, 551.